Marketers often talk about the importance of a strong brand to firms and many analysts believe an ever-increasing percentage of business value is derived from intangible assets. In 2013, Interbrand valued Starbucks as the world’s most valuable coffeehouse brand at $4.4b. But what does this actually mean? How does a strong brand benefit Starbucks through its impact external stakeholders, such as customers and suppliers? According to Michael Porter (1980), competitive rivalry is maximised where the threat of new entrants, substitutes, power of buyers and power of suppliers are all low – a theory known as Porter’s Five Forces. Using this theory as a basis, it is important for us to understand whether the Starbucks corporate brand impacts these four forces. Starbucks’ brand image is very strong. CEO Howard Schultz has emotionally positioned Starbucks as a ‘third place’ in customers’ minds, alongside home and work, to make Starbucks a part of their routine. This creates power by reducing customer susceptibility to visiting competitor stores in proximity to Starbucks, making it an unattractive market for new entrants. Furthermore, although two-thirds of the UK’s 15,000 coffee shops are independent, a report by the Public Accounts Committee in January 2014 says entrepreneurs will “struggle to obtain the finance they need to start up, operate or grow” their businesses despite government schemes to help small firms. Instead, larger companies have access to more funding sources, such as syndicated lending markets and can negotiate more favourable interest rates due to reduced risk on the lender’s part, helping to fuel Starbuck’s growth to 760 stores in 2014. This is possibly the biggest challenge for Starbucks due to UK buyers’ significant choice in coffee shops. Furthermore with the difficulty of patenting coffee products, successful innovations such as the Frappaccino are subject to copycat products – as admitted by Costa to “give customers what they are demanding”. Despite this, Starbucks has attempted to successfully create an official customer community of brand advocates through MyStarbucksIdea.com, which takes suggestions and generates discussion as to how the company should improve. Since launch in 2008, 98,000 ideas have been submitted and more than 100 adopted – ranging from community projects to bringing back Salted Caramel Hot Chocolate. Numerous studies have highlighted the correlation between listening to customers and customer loyalty, which is clearly critical in an industry with low switching costs. With 20,891 global stores, almost double that of the second biggest coffeehouse chain Dunkin’ Donuts’ 10,083 stores, Starbucks is able to take advantage of its size and benefit of economies of scale. In addition, suppliers are willing to offer favourable terms simply to be associated with Starbucks – in order to promote approval of the world’s largest coffeehouse brand. However, the benefit of this has somewhat subsided since 2000, following Starbucks’ pledge to only serve Fairtrade coffee; the company now pays 23% above market price for its beans. That said, Starbucks’ brand ensures that it cannot be held to ransom, since substitutes are available in mass should the company desire to buy elsewhere. Therefore, this ensures other brand leverage benefits, such as efficiency in delivery and favourable pricing arrangements. Starbucks is well-aware of potential threats from sandwich bars and other food retailers developing their own coffee offering and has responded by expanding its food product portfolio. Consequently, food now accounts for 19% of total revenue. Furthermore, identifying that the average British consumer drinks 56 cups of coffee a month, but only two of them from a coffee shop, creates an opportunity to generate revenue from the home coffee market. According to Levy & Weitz (2011), an established brand name can reduce costs of market development due to customers’ strong awareness and existing preference, as evidenced in Starbucks VIA achieving global sales of $100m in 10 months, following 2010 launch. To conclude, it is clear from the above explanations that the Starbucks brand does offer the company significantly enhanced competitive rivalry through its contribution to the reduction of all four threats. Therefore, in accordance with Porter’s Five Forces theory, it can be said that Starbucks’ strong brand influences its external environment and the coffeehouse industry as a whole – which helps us to begin understanding the benefits to Starbucks of its $4.4b brand value. 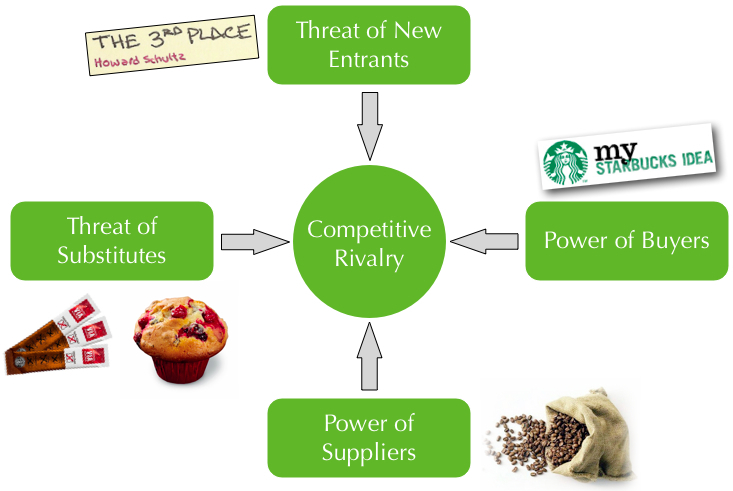 This entry was posted in Branding and tagged Coffee, Competitive Rivalry, Michael Porter, Porter's Five Forces, Power of Buyers, Power of Suppliers, Starbucks, Threat of New Entrants, Threat of Substitutes. Bookmark the permalink. I recognise the Starbucks brand through its logo, and its association with coffee. I am not captivated by the brand, never tasted its coffee, and the mental block for me with that brand is the coffee is the product is so expensive. Competitors in my town of Colchester can hold their own, through a clever innovation of linking their coffee shop to another service or product: examples include a beauty salon, a book shop and a laundrette.